HEARING one of your sporting heroes describe you as “one of the best kids in the country” is a huge motivator and Lewis Crocker wants to prove his credentials as a top prospect when he takes on durable Pole, Sylwester Walczak – a former opponent of Tyrone McKenna – in his third pro contest this Saturday. Two years ago, Crocker was controversially snubbed for the Commonwealth Youth Games with Carl Frampton leading the cries of foul and being quoted as paying the above compliment to describe ‘The Croc’, so it was perhaps inevitable the Sandy Row native would be given a slot on Frampton’s return to Belfast. That is exactly how it has played out and on Saturday, the 20 year-old former Holy Trinity amateur will look to put on display his fearsome power against Walczak. So far in his career, Crocker has made light work of Ferenc Jarko and Radoslav Mitev with Jarko lasting just 67 while Mitev survived a little longer, but was eventually stopped towards the end of the second round. Both of those contests took place at the Waterfront Hall and this Saturday, Crocker steps it up in terms of venue and opponent, something he is extremely excited about. “It’s a big step-up in terms of venue,” said the South Belfast man whose mild mannered nature outside the ring is at odds with his ferocious aggression inside the ropes. “Getting to fight on the Frampton card is class and I’m really looking forward to it. “It gives me great confidence I’m getting to fight on the undercard of Frampton. It’s great motivation for me and has helped me to train harder. I’m in good shape already and just can’t wait to get in there. “He is in the pound-for-pound list so it’s great to have someone like that to look up to. “He is a great role model so hopefully loads of the boys can get the same results he has had in their pro career and progress. Crocker is honing his skills under the eyes of Ray Ginley and Dee Walsh with their stable growing in terms of size and quality with a number of top-class boxers part of the team. Crocker is just another of the team who seems to have the world in their hands, but he is in no rush to start climbing the rungs too quickly. Instead, he is content to bide his time, learn his trade and do what he does best – excite fans with his all-action style and Tyson-esque punching power. “If the finish is there I’ll take it,” he said when asked if he would prefer stoppages or rounds under his belt. “If the rounds are there, I still look for the finish. I don’t plan on getting the rounds in. “They are tiny gloves (compared to amateur boxing). If anyone gets with them they are going to get hurt no matter what. At the end of the day, it’s a fight and I love to fight. I don’t care about the rounds, I just want to get out of there before the time is over. 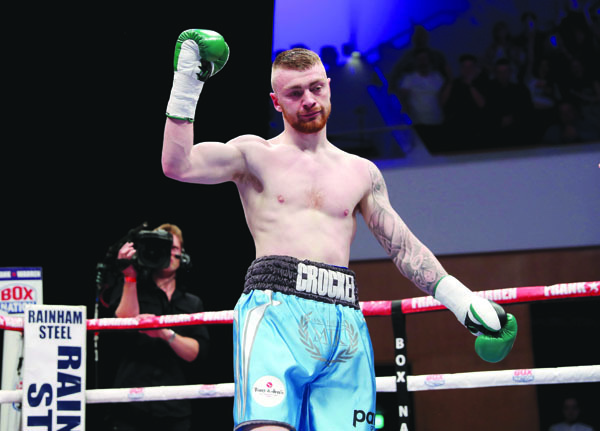 Indeed, there is a buzz around Crocker and that ought to ensure a big crowd is in the arena to see just what those in Irish boxing circles already know – that the South Belfast welterweight is one to follow closely. Having boxed twice on those Waterfront cards, he is now looking forward to marching to the ring at the SSE Arena and delivering a performance befitting of the occasion to make it three wins from three and enhance his reputation further. “The crowd he (Frampton) brings is class so I’m looking forward to fighting in front of it,” he confirmed.